If you're looking for a more capable and professional version of SIR or simply a great convolution processor, SIR2 fits the bill nicely. Slick, easy-to-use GUI. Straightforward and effective controls. Improved functionality. Included HDIRs sound great. Requires HDIR Extra Package to get the most of it. The original SIR could be enough for some. The original SIR (Super Impulse Reverb) convolution plug-in has become a huge underground hit, and not just for reverb usage either. It´s a simple yet effective plug-in that´s suitable for all your convolution needs. However, it does have its limits, in particular that it has a fixed latency of 8960 samples, prohibiting its use as a real-time effect. It's only able to handle simple stereo (or mono) impulse responses, too. Realistically, these are small niggles when you consider that SIR is freeware. Developer Christian Knufinke has finally come up with a successor, though, which is intended to be the bigger, better, not to mention costlier version. First off, SIR2 sorts out the aforementioned problems. It has a new zero-latency mode, which is ideal for real-time usage, and there's also a 1024-sample fixed-latency option for those keen to reduce CPU usage. 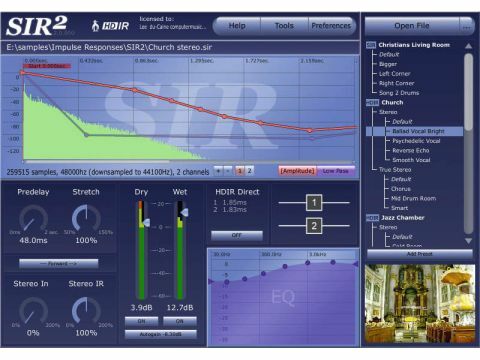 SIR2 also has four 'true stereo' High Definition Impulse Responses (HDIRs) of real spaces (Church, Recording Studio, Jazz Chamber, Theatre). These were produced by Pinguin of Hamburg, and sit alongside two further stereo IRs. There are several presets based on each of these. Support is now given to a range of file formats, too - WAV, BWF, AIFF, FLAC, OGG, and dedicated SIR files - so you can load any favourite IRs you already have. Although SIR2 doesn't differ vastly from the original in its controls, the slicker GUI is immediately easier on the eyes, and it's evident that this is a refined and classier deal. SIR2 relies on its graphical display (as opposed to the basic envelope sliders of SIR) to edit the length of IRs, and you can simply draw amplitude and low-pass envelopes of any shape onto the wave display, which opens up whole new worlds of tweaking. The display can also be switched between Time Scale and Beat Scale, the latter being locked to the host tempo, thus enabling some truly beat-tastic editing possibilities. You've got the obligatory wet/dry level controls, with a handy Autogain function (useful for comparing IRs of different volumes); a linear phase graphic EQ to tailor your IRs; and controls to widen or narrow the stereo width of the input signal or the IR. You can also set a pre-delay, stretch the IR to give the impression of a larger or smaller reverb space, and easily reverse it, too, for those ghostly reverse 'verbs. One neat touch is that if you save patches as SIR files, you can add a JPEG to represent them in the GUI. The included HDIR reverb presets dazzle with spatiality, and are comparable to the very best convolution reverbs around (though the HDIR Extra Package will be a mandatory purchase for all IR addicts). Along with the other functional improvements, this should go a long way towards convincing many to make the jump from SIR.